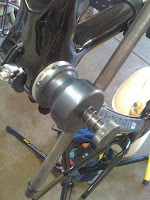 stickboybike: Campy ISO BB tool. I have a very good selection of tools that can be used to fix most road and mountain bikes. 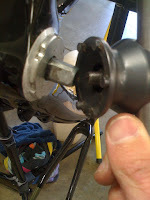 However, while doing a build up for a cycling comrade, I did not have a BB tool for Campagnolo's Dayton/Veloce. Ugh! I called up one of my dealers that happens to be within a 15 min drive of my house and this is what he had to offer. The story behind this gorgeous tool is that it was made by a Swiss tool maker and he can no longer be contacted or found for that matter. The tool engages the flange notches wonderfully and a spring loaded shaft threads into the BB axle to prevent any slippage during full torque/removal or installation. I've used the Park BBT-4 in the past for a job like this and it pales in comparison to what the Swiss tool can accomplish.